The MLS Home Price Index (HPI) in January was up 15.0% year-over-year (y-o-y). Home sales over Canadian MLS Sys tems edged down by 1.3% month-over-month in January 2017, putting them at the second lowest monthly level since the fall of 2015 and only slightly above levels recorded last November when recently tightened mortgage regulations came into effect. The MLS Home Price Index (MLS HPI) now includes Oakville-Milton and Guelph, and has been historically revised to ensure that all aggregate measures remain comparable. 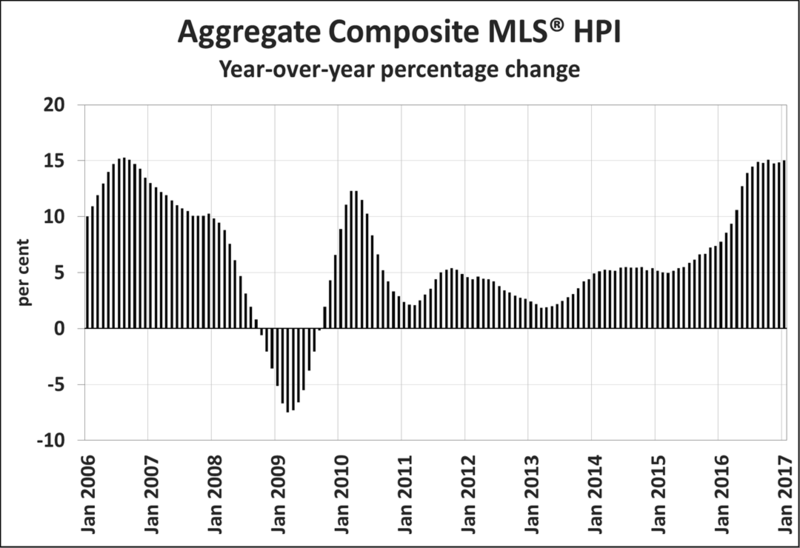 The Aggregate Composite MLS HPI rose by 15.0% y-o-y in January 2017. This was up slightly from December’s gain, reflecting an acceleration in apartment and townhouse/row unit price increases. While benchmark home prices were up from year-ago levels in 10 of 13 housing markets tracked by the MLS HPI, price trends continued to vary widely by location. The MLS Home Price Index (MLS HPI) provides the best way of gauging price trends because average price trends are prone to being strongly distorted by changes in the mix of sales activity from one month to the next. PLEASE NOTE: The information contained in this news release combines both major market and national sales information from MLS Systems from the previous month. MLS Systems are co-operative marketing systems used only by Canada’s real estate Boards to ensure maximum exposure of properties listed for sale. The Canadian Real Estate Association (CREA) is one of Canada’s largest single-industry trade associations, representing more than 120,000 realtors working through some 90 real estate Boards and Associations. Nationally, sales activity is forecast to rise by 6.1 per cent to 536,400 units in 2016. This would represent a new annual record, but remain below the peak reached in the 2007 after adjusting for population growth. According to statistics released today by The Canadian Real Estate Association (CREA), national home sales dropped in May 2016 after having set an all-time monthly record in April. Little has been reported about the group of Canadians just outside the housing market, sitting on the sidelines, thinking about buying or remaining renters. In this new Spring Survey, The Next Generation of Homebuyers, Mortgage Professionals Canada steps into the future to look at what these perspective homebuyers are thinking when it comes to investing in a home. The report segments Next Gens into three categories based on their purchase time horizon: Distant Buyers looking to purchase beyond the next five years who may be less informed about the housing market conditions and the process involved in purchasing and financing a property; Mid-term Buyers looking to purchase in one to five years; and Imminent Buyers who are looking to purchase in the next year. The majority of Next Gens feel that Canadian real estate is a good long-term investment and 72 per cent view having a mortgage as good debt. They have other debt to consider, however, before they’re ready to purchase. Young Canadians today are carrying heavier student loans than any previous generation. They also want to continue saving for a down payment or are waiting for important milestones in their lives like a promotion or marriage. These factors together with the high costs of homeownership are causing a majority of Next Gens to delay their purchase to sometime in the next five years. With average household incomes of $75,000 and average savings of $27,000, 61 per cent of Next Gens expect to make a down payment of less than 20 per cent of the purchase price of their home. Increasingly more self-reliant, this group is also expecting to front their down payments themselves, with 73 per cent relying on their own personal savings and only 36 per cent relying on gifts or loans from family. Despite the increased price, Next Gens are hoping their first homes will be a low-rise dwelling (80 per cent), over a condominium (18 per cent). The majority are looking for detached homes (59 per cent), while 13 per cent are pursuing a townhouse or eight per cent a semi-detached home. Next Gens living in Ontario and Western Canada are slightly more likely to opt for a condo (19 per cent and 21 per cent, respectively) compared to Atlantic Canada (10 per cent). Overall, when Next Gens do enter the housing market, 93 per cent will be looking for a mortgage. While Next Gens as a whole either aren’t too sure of the type of mortgage to expect (30 per cent) or are planning on a combination mortgage (30 per cent), those looking to purchase in the next year are planning for either a fixed-rate (32 per cent) or combination (33 per cent) mortgage, with a median interest rate expectation of 3%. Nearly two thirds of imminent buyers (61 per cent) expect an amortization of 25 years, while 71 per cent expect to pay off their mortgage in less than 25 years. For a full copy of The Next Generation of Homebuyers, click here. Mortgage Professionals Canada (formerly CAAMP) is Canada’s national mortgage broker channel association representing more than 11,000 members from coast to coast. We recognize that Canadians need and deserve more. We believe in competition as it produces better options and demands ever-improving service and products. We believe in choice as it benefits Canadians and delivers an environment of opportunity. We believe in professionalism as it demonstrates commitment, trust and excellence. The mortgage broker channel is a critical and valuable profession. It creates possibility, fuels the economy and provides Canadians with choice when making among the most important financial decisions of their lives. The Canadian Real Estate Association (CREA) has updated its forecast for home sales activity via the Multiple Listing Service® (MLS®) Systems of Canadian real estate Boards and Associations for 2016 and extended it to include 2017. CREA’s recent forecasts anticipated that housing activity would rebalance in 2016, with cooling activity and smaller price gains in British Columbia and Ontario, resulting in slower national price growth. However, many of the defining themes among Canadian housing markets last year have persisted, and in some cases intensified, in early 2016. Interest rate are now also widely expected to remain low for longer, with administered lending rates beginning to rise no earlier than the second half of 2017. Canadian resale housing market trends this year are expected to resemble those apparent in 2015, with very tight supply leading to strong price gains in British Columbia and Ontario – particularly in the Lower Mainland and in and around the Greater Toronto Area. Price gains in these regions are expected to continue to stand in sharp contrast to moderate price declines among housing markets whose prospects are closely tied to oil and other natural resource prices. In line with the prevailing forecast for stronger Canadian economic growth beginning in the second half of 2016, Canadian home sales activity is now expected to rebalance in 2017. Nationally, sales activity is forecast to rise by one per cent to 511,400 units in 2016. The annual increase continues to reflect significant regional variations in housing market trends (Chart A). British Columbia is again forecast to post the largest annual increase in activity (+11.8 per cent), with Alberta expected the record the largest annual sales decline (-18.7 per cent). A lack of supply is expected to hold activity in check in Ontario in 2016 (+0.3 per cent) despite the continuation of very strong demand. Elsewhere, modest sales gains in Manitoba (+3.4 per cent), Quebec (+3.4 per cent), New Brunswick (+1.2 per cent), Nova Scotia (+1.1 per cent) and Prince Edward Island (+3.3 per cent) are forecast for 2016, reflecting expected improvements in these province’s economic prospects. By contrast, sales activity in 2016 is forecast to ease in Saskatchewan Newfoundland and Labrador, two of Canada’s major oil producing provinces, by 3.7 per cent and 4.5 per cent respectively. With prices continuing to push higher in British Columbia and Ontario and sales in these expensive real estate markets hitting record highs, CREA’s forecast for national average price has been revised upward to $478,100 in 2016, representing an annual increase of eight per cent. British Columbia is forecast to be the only province where average home prices rise materially faster (+10.0 per cent) than the national average, reflecting an increasing proportion of sales above $1 million. The rise in Ontario’s average price (+8.2 per cent) is forecast to be roughly in line with the national increase. Elsewhere, average prices in 2016 are forecast to rise by 2.1 per cent in Manitoba, 1.6 per cent in Quebec, and 1.1 per cent in both Nova Scotia and Prince Edward Island. Average prices are forecast recede in Alberta (-2.5 per cent), Saskatchewan (-2.4 per cent), New Brunswick (-0.4 per cent) and Newfoundland and Labrador (-1.4 per cent). In 2017, national sales are forecast to number 513,400 units. This is little changed (+0.4 per cent) from forecast levels for 2016, as activity in B.C. and Ontario comes off the boil due to deteriorating affordability while confidence begins to recover in provinces hardest hit by weak prices for oil and other natural resources. Consumer confidence is anticipated to strengthen and begin drawing homebuyers off the sidelines in Alberta, Saskatchewan and Newfoundland and Labrador as their economic prospects improve. This is anticipated to contribute to a modest rebound in sales activity in these provinces in 2017. British Columbia is the only province forecast to post an annual decline in home sales in 2017, reflecting a combination of a growing shortage of single family homes available for sale and deteriorating affordability. Even so, activity is expected to continue trending near record levels. Ontario is forecast to see sales level off in 2017. Sales activity is forecast to continue to push higher in Manitoba, Quebec, and Nova Scotia in 2017, reflecting the prevailing forecast for improving economic prospects in these provinces. Sales in Prince Edward Island are also forecast to improve as the province continues to benefit from a lower Canadian dollar. The national average price is forecast to edge higher by 1.1 per cent to $482,500 in 2017, with modest price gains near or below inflation among provinces. Slower national average price growth in 2017 reflects weaker price gains in British Columbia and Ontario. Price trends in these provinces reflect an anticipated slowdown in luxury sales activity, a continuing supply shortage of relatively more affordable low rise family homes and an anticipated increase in relatively more affordable condo unit sales as a proportion of total sales activity. In other provinces, an ample supply of listings relative to demand will continue to keep price gains in check. I think it is only fair to point out that the real estate forecast below, was done by the CREA (Canadian Real Estate Association) who have a vested interest in people believing house prices are still going up, and therefore a good investment. It is only a forecast based on the market’s past behaviour and what the CREA hopes will happen. Home prices are actually on the decline in many parts of Canada and interest rates have started climbing. Press Release – Alberta, Saskatchewan and Newfoundland and Labrador are forecast to see average home prices decline by 2.5 per cent, 1.2 per cent and one per cent respectively in 2016, according to the Canadian Real Estate Association (CREA). The downturn in the oil industry may be one of the major reasons for the decline. British Columbia will be the only province this year where average home prices rise faster (+11.5 per cent) than the national average. The rise in Ontario’s average price (+8.0 per cent) is forecast to be roughly in line with the national increase. CREA says that low interest rates will assist sales but that the federal government’s recent reforms to mortgage lending rules will have a negative effect beyond its intended targets in the Vancouver and Toronto areas. New mortgage rules will also likely reduce sales activity in Calgary once they take effect early next year. The forecast for national sales in 2015 has been revised higher, reflecting stronger than anticipated activity in B.C. and Ontario. National sales are now projected to rise by five per cent marking the second strongest year on record for home sales in Canada. British Columbia is projected to post the largest annual increase in sales activity in 2015 (+21.4 per cent), while home sales in Ontario are projected to rise by 9.3 per cent. The increase would in all likelihood be higher were it not for a shortage of low rise homes available for purchase in and around the Greater Toronto Area (GTA). 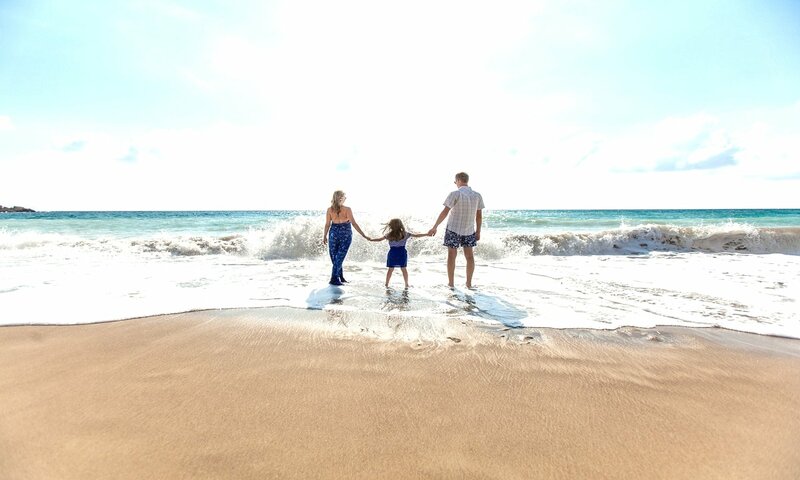 Sales in Quebec and New Brunswick are forecast to rise by 4.8 per cent and 5.4 per cent respectively while activity in Prince Edward Island, having benefitted from the lower Canadian dollar, is expected to be up 18.8 per cent from 2014 levels. CREA is one of Canada’s largest single-industry trade associations, representing more than 111,000 REALTORS® working through 90 real estate Boards and Associations.